These are apple varieties that have been tested in a hot and humid climate and are very suitable for the tropics. The qualities we look for are apples that stay crisp and juicy during high heat, color up well despite hot nights, have some disease resistance, have a very low chilling-hour requirement, and keep well without refrigeration. Some of these apples are from the American South, and others are traditional favorites for the tropics that have been grown there for years. Still others are cold-climate apples that have shown remarkable adaptability to tropic conditions. All of them are better than anything you have tasted in the market and will be a definite improvement over what is commonly grown in the tropics. Remember; it only takes one good apple that performs well in an area to build an entire industry around; many fortunes have been tied to an apple variety that markets well or can be grown best only in a certain area. We recommend that you try a wide variety to see what does best in your particular location. We have an additional list here. 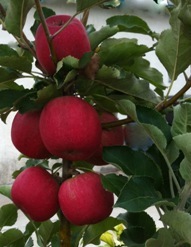 See our page regarding Anna and Dorsett Golden apples before ordering. We are proud to offer many apple varieties resistant to the main fungal diseases in Uganda, scab and powdery mildew. When combined with good cultural practices, these apples can eliminate the need to spray. They are also excellent quality apples, desirable to growers even in regions where fungal disease is not a problem. Anna Israel, 1959 Bred at Kibbutz Ein Shemer in Doar Na Shomron by Abba Stein as a cross between the local cultivars Red Hadassiya (a plum-sized apple) and Golden Delicious. 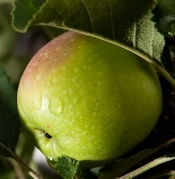 Considered the standard in low-chilling apples, Anna is Israel's gift to the world as it feeds half the tropical world. The showy blossoms burst fourth in late January and every blossom sets an apple (thin heavily). Aggressive thinners will be rewarded with humongous, beautiful apples blushed red and yellow. Anna must be pollinated with Dorsett Golden or Shell of Alabama to get this size. The flesh is white, crisp, sweet, juicy, with a hint of zing; it makes excellent apple pies. See our page regarding Anna. 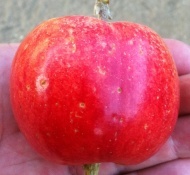 ☺Akane Japan, 1960’s One of the better-tasting early varieties, a cross between Jonathan and Worcester Pearmain. 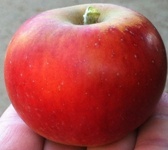 The medium-sized bright red apple has a thin skin and white, crisp, juicy flesh with a hint of strawberry flavor. It’s good for fresh eating, cooking, and drying, which is good because it doesn’t keep well. When cooked with the peels the applesauce turns pink. It hangs well on the tree allowing extended harvest time. It has good disease resistance. ☺Arkcharm Arkansas, recent Developed by the University of Arkansas (a very hot and humid part of the USA), Arkcharm keeps its quality and colors up well despite high heat. It ripens earlier in the season and has a good sugar/acid balance and complex flavor. It has good disease resistance but does not keep very long and should be eaten right away; it would be good for processing into juice or dried apples if marketing takes more than a few days. ☺Aunt Rachel North Carolina, USA Originated as local apple in Chatham County, North Carolina. Fruit begins ripening early in the season and continues for two to three weeks. 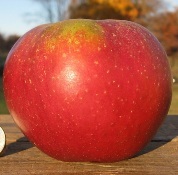 One of the best early season apples, Aunt Rachel is a medium to large, red-striped apple covered with prominent light dots. Very attractive with very fine flavor, good disease resistance. No catalog listing or background was ever found, and so this may be a very rare seedling apple grown only in a small part of the American South (until now). 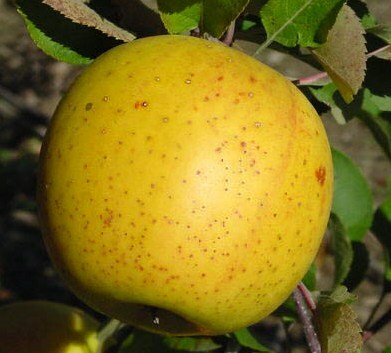 ☺Bramley England, 1800 Bramley is the national cooking apple of England and many will find it odd for it to be on this list, but it has proven to be very reliable in a tropic climate. It is very vigorous (the original 200-year-old tree is still growing and bearing apples in Nottingham) and annual bearing. It is quite tart until completely ripe and makes an applesauce that will about blow your head off with an intense flavor. Resistant to scab and powdery mildew. For an apple from such a cool climate it sure is not bothered by the heat any, tolerating 45 C. with no problems. Dixie Red Delight Alabama, 1960’s A sport of Red Delight of the early 1900's, Dixie Red Delight was developed by an amateur horticulturist, Oren T. Bolding, of Sylacauga, Alabama. 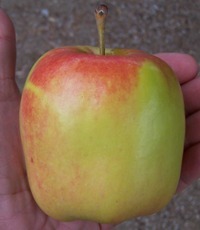 Fruit is medium to large, with red skin and yellow ground color. Flavor is sharp, sweet, aromatic, and spicy, and improves in storage; the closest thing to Virginia Winesap we've tasted in a hot climate. Keeps well and improves in storage, bears heavily and reliably, ripens late in the season and blooms late. ☺Dula's Beauty North Carolina, USA late 1800's Originated from seeds of a Limbertwig planted by J. A. Dula of Lenoir, North Carolina. It is a strong, vigorous tree well adapted to all growing conditions. In 1908, the NC Dept. of Agriculture recommended this variety for lowland coastal growers (a very warm climate). Fruit is large and slightly conical with dark-red skin overlaid with darker red stripes. Flesh is yellowish-white, tender, crisp and juicy. Ripens late fall to early winter, good disease resistance. ☺Enterprise Indiana, USA, 1982 A product of the Purdue, Rutgers, University of Illinois (PRI) breeding program, Enterprise is a reliable, late-maturing apple that is immune to scab and resistant to powdery mildew. 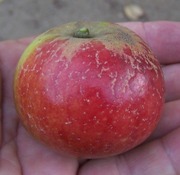 The apples have a waxy "bloom" that polishes off to a high shine, showing off the fire-engine red skin. The flesh is very firm and juicy, with a good complex flavor. The tree tends to over-bear crops of smaller apples, and so thinning heavily is necessary to achieve good size. The apples drop off the tree when ripe. Fuji Japan, 1962 Despite its commercial success, few people have tasted Fuji as it was meant to be, which is sweet, flavorful, crunchy, and ridiculously juicy. This is because it requires a long, hot season to pump the full quota of sugar and flavor into the orangish yellow flesh. Just because the skin has colored up doesn't mean it is ripe, although the skin never does really color up well. Fuji takes about 5 years to start producing, but reliably sets a full crop every year after that; thin hard and you'll get huge apples. Ripens late and keeps extremely well, self-fertile. A mandatory apple for all areas; it is that good. ☺GoldRush Illinois, 1972 Another product of the PRI disease-resistant breeding program, GoldRush is immune to scab and highly resistant to powdery mildew. It is rated tops in both flavor and keeping abilities, and is said to actually improve in storage. We have found the tree to be productive and well-adapted to a warm climate. The crisp, juicy flesh is like a cross between Fuji and Winesap, having a complexity to go along with high levels of sugar and acid. 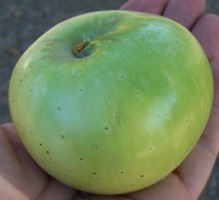 Granny Smith Australia, 1868 Sprouted from a washtub of French crab apple trimmings tossed out by an actual granny, Maria Anne Smith of the Ryde District of New South Wales, Australia. You may be surprised if you're expecting the homogenous, lime-green coloring like in the market, as when ripe Granny Smith has a pinkish-orange blush on the sunny side. It needs a long, hot season to attain the best flavor, and makes excellent pies. The tree requires very little care. Hunge North Carolina, 1700's A vigorous grower, well-adapted to zero-chill warm climates in East Africa. The crisp, juicy flesh is intensely sweet-tart, overwhelming at first, but becoming more tolerable on the second bite with a winey flavor. It is also excellent dried and cooked. Ripens mid-season, about 6-8 weeks after Anna. ☺King David Arkansas, 1893 This turned out to be one of our favorite apples, and for good reason; it was Stark Bros. Nursery's biggest producer for years and considered tops in flavor in warm climates, proving itself very adaptable. The apples are very hard until ripe and are somewhat insect-resistant. It turns deep purple, almost black and hangs late on the tree and should be picked when full color develops. Yellow flesh, firm, crisp and juicy with a deep, dark, rich winey flavor that matches the color, a favorite with most people who try it. Lady Williams Australia, 1935 A Granny Smith offspring that is also a parent of Pink Lady. 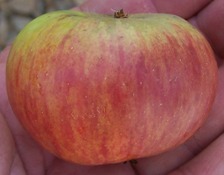 A pinkish-red apple with a distinctive horizontal white stripe on one side that ripens very late and needs a long hot season, usually ripening two months later than most other apples. It is quite tart until fully ripe, when it developed a nice sweet/tart balance. So far it has out-produced its offspring Cripp's Pink (aka Pink Lady) and is grown in the jungles of Malaysia with good success. ☺Liberty New York, USA 1966 Considered the most disease-resistant apple in the world, Liberty is a product of the New York State Agricultural Experiment Station at Geneva fruit breeding program. The beautiful apple with a sweet, spicy flavor comes from an extremely productive tree. Although best eaten fresh, Liberty does store well for several months, and then makes an excellent pie. Ripens over a long time and is self-fertile. Mollie's Delicious New York, 1966 Unrelated to the accursed Red Delicious, Mollie's Delicious is an excellent apple for hot climates, a cross between Golden Delicious and Red Gravenstein. Sweet, firm, crisp, and aromatic but with not much acid. Has a beautiful red blush over yellow. Pollinator required: Fuji, or Granny Smith; ripens mid-season, stays crisp in the heat, keeps rather well, supposedly improves after a month in storage. 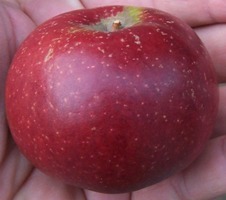 ☺Red Rebel Virginia, USA 1850 This beautiful apple originated in Rappahannock, Virginia on the farm of Captain Charles B. Wood. 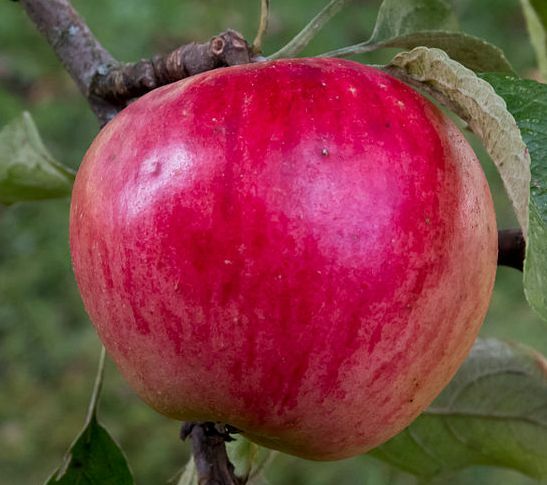 It was once described in old nursery catalogs as "the prettiest apple that grows." Despite its attractiveness and fine flavor, the apple never gained a following in the American South and was thought to be lost until apple hunter Joyce Neighbors of Gadsden, Alabama, found an old tree growing in nearby Wedowee which had been planted in the 1930's. Thanks to her efforts, this wonderful old apple is once again available. 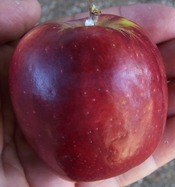 The apple is medium to large with deep dark red skin over a light yellow background. The yellowish flesh is crisp with a fine sweet-tart flavor. Ripens late season. ☺Reverend Morgan Texas, 1965 A local family heirloom of the Deep South, originating in Houston, Texas, an area known more for cattle, rice, and sugar cane than apples. The apple was first raised by Reverend Herman T. Morgan in 1965 from seeds of Granny Smith and produced its first fruit in 1972. It is well adapted to tropic conditions and does well wherever it's tried. Fruit is medium to large, roundish-conical with rich pinkish-red skin. A fine quality apple that ripens in late in the season. Shell of Alabama Alabama, late 1800’s Originating in the USA southern state of Alabama, this was developed by Mr. Green Shell (born 1841). Mr. Shell had an apple orchard in the warm climate of Escambia County, and developed an industry around this apple, shipping boxcars of crisp, somewhat tart, green apples north in July before other apples were ripe. We're recommending it as a companion to Anna and Dorsett Golden, as it blossoms and ripens with them and is their equal in vigor and much superior to the detestable Ein Shemer, a terrible apple which used to be though of as a pollinator for Anna. Sierra Beauty California, USA, 1890 A byproduct of the California gold-rush era, Sierra Beauty was discovered as a seedling high in the Sierra Nevada mountains. Offered by nurseries for a few years, it became extinct except as an heirloom of the Gowan Family of Philo (Mendocino County) until "rediscovered" around 1980. Tends toward biannual bearing, so thin heavily for more consistent crops. 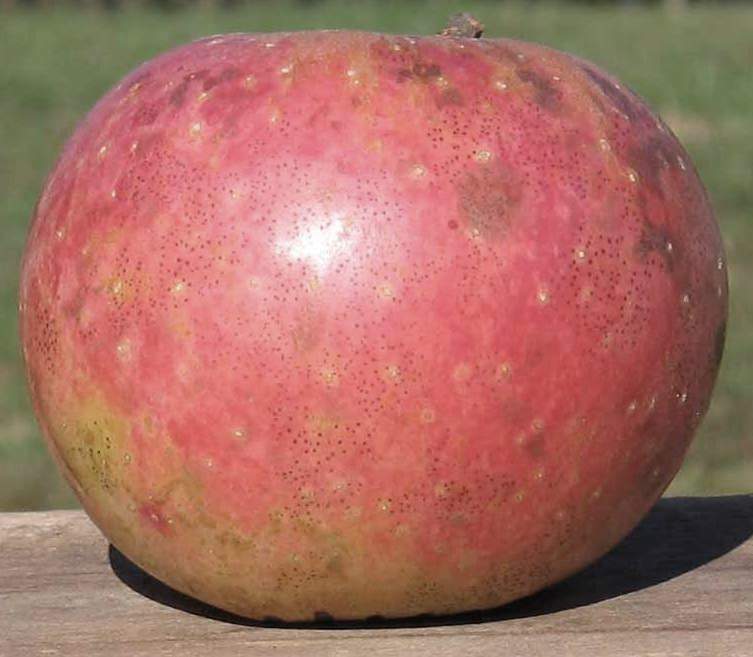 A beautiful apple with striking appearance, firm texture, and is very tart until fully ripe when it has an intense sweet-tart flavor that begs for another bite. Ripens late in the season. Terry Winter Georgia, USA, 1850’s An excellent old southern apple noted for its long-keeping abilities for warm winter areas. It originated before the American Civil War with a Mr. Terry of Fulton County, Georgia, and was soon widely sold throughout Georgia and neighboring states. Medium-sized fruit with thick, tough yellow skin covered with stripes and splashes of red and crimson. The white flesh is crisp, sweet/tart and juicy. This is one of the most prolific varieties we have, setting a huge crop the second year. Make sure to thin heavily for the best quality. Ripens late in the season over a long period. 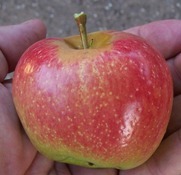 Tompkins County King New York, 1804 A large apple with a yellow skin is flushed a pale-red with darker red stripes and white or russet dots. The yellow flesh is coarse, crisp, and tender, with a sweet/tart and aromatic flavor. Vigorous and spreading, the tree grows naturally small. The limbs grow nearly horizontal with many crossing branches. A pollen sterile triploid, it will not pollinate other trees or itself. it has a tendency to watercore, where the flesh becomes translucent and very sweet. Ripens very late in the season; hangs on the tree until it's past its prime, so keep an eye on it. ☺Williams' Pride Indiana, 1985 A product of the Purdue, Rutgers, and University of Illinois (PRI) breeding program of disease-resistant apples, Williams' Pride is field immune to scab and cedar apple rust and highly resistant to fireblight, moderately resistant to powdery mildew. Despite very warm nights it still develops a deep red color, approaching purple. It ripens in hot weather and is amazing for the quality the golden yellow, crisp, juicy, spicy flesh attains, keeping quite well for a early-season apple It bears early and heavily even on vigorous rootstocks. The tree has a good growth habit with wide branch angles and lots of spurs to bear heavily. These are just the apple varieties we've picked out for the tropics for you to start out with; choosing this list was like trying to choose among your children. We have also prepared a list of more apples that could just have easily made this list, and we will have these available as custom-grafted orders. We have many more varieties on hand and hundreds more we can order; if you have your heart set on something we can usually custom-graft it for you. Who knows, maybe your selection will do well in the tropics and start a whole industry.